Thanks everyone for all your kind emails while I was in the slammer. The hospital volunteer who brought the messages to my bedside, said he’d never delivered so many messages to one person , and that I must be pretty popular:-) Sorry I couldn’t respond to each one individually, but I read all one of them, and they brought a smile to my face. It’s definitely a plus, when people are rooting for you. As far as incarcerations go, this one went pretty smooth and was fairly minor in intensity without any major surprises. Because the ER staff at UCSF know me so well, I didn’t have to spend that much time in the ER and was admitted promptly to the ICU. And because I had the smarts to come in early on in the exacerbation, I managed to avoid intubation…. which also means I suffered less trauma to my body in general. They didn’t have to put any IVs in my feet this time, but they did have to put one in my thumb…ouch! 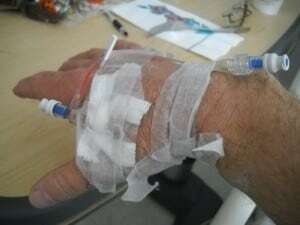 In total I spent just 2 days in the Intensive Care Unit and day and a half in the step down unit. I was released on good behavior ( and because I’m an RT) Friday afternoon. They know I can take care of myself pretty good at home, so they’re always willing to discharge me sooner than they would with other asthma patients. My PFs on discharge were still in my red zone, but trending upward. About the only complication I had this time around, was some benign,but really annoying heart palpitations/ectopy ( PVCs) probably caused from all the albuterol. Over a 4 day period, I received a total of 270 mg of Albuterol . To give you an idea of how much Albuterol that is, a single neb treatment contains only 2.5 mg , which means I received the equivalent of about 108 individual neb treatments. I also received 2 grams of Magnesium over 30 minutes ( instead of 1 gram) ,which is something new they’re doing for patients at UCSF with status asthmaticus. While I was in the ICU they also gave me the (regular) flu shot, which was pretty cool , because now I don’t have to make a separate trip back to the hospital just for that. Because of my hypoxemia,they also wanted to test me for HIV , which I agreed to, and which of course was negative. 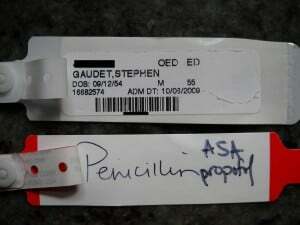 Also new this time, is that they had Propofol ( the Micheal Jackson drug) listed as one of my allergies on my allergy bracelet, because of the reaction I had to it the last time I was intubated. Unfortunately, most of the alternative sedative drugs don’t work as well as Propofol. Hopefully, I won’t have test that theory anytime soon. The Nurses I encountered during this 96th hospitalization were incredibly kind and professional. The ICU and TCU nurses in particular were awesome. Thank you Jen RN, Linda RN, Kevin(ICU Nurse Practitioner) and Susan RN , for putting up with me. The RTs were awesome as well. Thanks Oscar and Carl and the others for all your help. It’s tough taking care of someone like me over and over again…I drive everyone crazy. 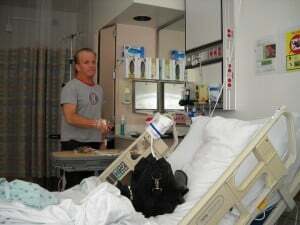 Last , but not least , a special thanks to Norm, one of the hospitals spiritual counselors, for spending time with me and for arranging a laptop to be send to my bed in ICU.. Thanks Norm! I’m still pretty sick and on a lot of medication, so it may be some time before I can resume my regular fitness and/or blogging activities. Thanks again everyone for your continued support . Also give a shout out to Tammy for taking 1st place in the racewalking division at last weekends Portland Marathon . PS..As it turns out, no one was really pissed off that I did the Rock&Roll race on Sunday and that it may have contributed to this flare-up. In fact, most of the doctors thought it was pretty cool that I did the race, and if it made me sick?… so what.. was their attitude. And . . . An IV in your thumb?? Oucccch! I'll be thinking of you during your recovery. Hey, there, thanks for the shout-out :). I think it is SO cool that the docs weren't upset w/you about the race. And you got yourself to the hospital quickly so avoided intubation, which seems like a good deal all the way around. It's WAY cool that you did the race 🙂 🙂 🙂 and that you racewalked so much of it. You are inspiring!!!!! keep taking care of yourself, glad you're home! Hope you don't need to go back for a while. ICU is more like Ick-U. Congrats on finishing the race, and you're so smart for not waiting too long! Glad to see you back. Hope you can avoid that "prison" for a while. Also, my friend, you kept your promise … no hospital on my birthday and no intubation either … I think that's the best present any girl could ever get! you always have such a great attitude through your trials. Wish I could say the same. Glad to see you're feeling better Steve! Virtual allergic to penecillin high five!